Water Quality Standards are the starting point for the decision framework that will be used to both determine the current condition of the Bay, as well as guide any restoration efforts. These standards can be called "yardsticks" that are used to determine the conditions of the Bay. The Department adopted narrative nutrient criteria for coastal waters on December 21, 2010. A comprehensive ambient monitoring effort was then needed to determine if water quality standards are being met. As a result, the DEP and its partners launched a new comprehensive ambient water quality monitoring project in the Barnegat Bay watershed on June 6, 2011. This network is designed to provide water quality data that will establish the baseline conditions of the bay and assess these conditions against water quality standards. This information will then direct actions, including the possible establishment of a TMDL (Total Maximum Daily Load), needed to restore the bay. Part 1 compares the observed water quality data to the applicable numeric surface water quality standards. The 2012 Methods Document was used as the basis for the assessment. Part 2 is a comparison between Barnegat Bay data and the targets used by other estuaries in the Northeast United States relative to narrative criteria. This portion of the assessment is intended to provide a general sense of the condition of Barnegat Bay relative to the range of targets identified for other estuaries to interpret narrative criteria. The Department currently lacks such interpretive criteria but is working to develop those that would apply to the unique conditions found in Barnegat Bay through the work underway for Action Items 7 and 9. Click the links below to download the report and supporting documents. The project, which is led by DEP, initially operated with 10 monitoring and laboratory partners. Within the network, water quality monitoring took place at 13 locations on tributaries to the bay and 14 locations within the bay itself. Stream flow was also monitored at the 13 tributary locations. In addition, between June 2011 and August 2012, 5 continuous monitors/gauges were installed or moved from previous locations to provide water quality data in the bay. A continuous monitor was already in place at 1 tributary location. The importance of the continuous monitors became apparent during Superstorm Sandy. The gauging stations which measure the quantity of water flowing into and out of the inlets were essential in measuring the coastal surge. The continuous measurement of water quality in the Bay enabled us to determine how quickly the turbidity decreased as the sediment stirred up during Sandy was able to settle. After reviewing data from June 2011- December 2012, the network was narrowed to the most important locations that will provide the data necessary to populate the water quality model (see USGS bullet below for additional information on this model). The network currently operates with 7 monitoring and 1 laboratory partner. Within the network, water quality monitoring is currently taking place at 7 locations on tributaries to the bay and 15 locations within the bay itself. Stream flow is still being monitored at the 7 tributary locations. Additionally, the 5 bay and 1 tributary continuous monitors/gauges are still providing additional water quality data. The map above displays each of these active monitoring locations, as well as stations which are currently either suspended or have been discontinued/ relocated. By clicking on each monitoring location, users can see the name and location of the monitoring site, which partner is doing the water quality and/or stream flow monitoring, link to partner websites, view photos of the site as well as access the monitoring data that has been collected - either at each individual station or all data for all stations. Click here to see a short video about the project, including tributary and bay monitoring as well as water sample processing and laboratory analysis. To see the current approved Quality Assurance Project Plan (QAPP) for the network, please click here (pdf). To view previous approved QAPPs for the network, please click here. Click here to learn details about the intensive monitoring effort that was conducted in July and August 2012. For a list of frequently asked questions related to this ambient water monitoring project, click here (pdf). Click here for information on the modeling and Bathymetry work, being performed by the US Geological Survey. 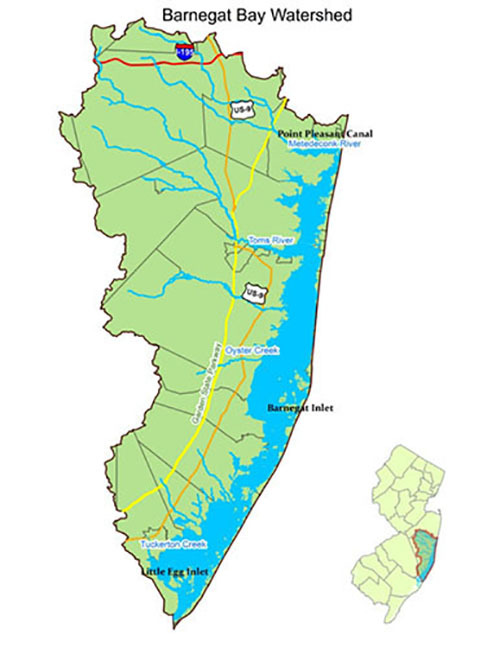 There are 2,157 stream miles within the Barnegat Bay watershed. 75% of the stream miles are protected as Outstanding National Resource Waters (ONRW) which includes streams classified as Freshwater 1 (FW1) and Pinelands Waters (PL) or Category One waters (C1). These waters are protected from water quality degradation because of their unique ecological significance, exceptional recreational significance, exceptional water supply significance or exceptional fisheries resource. For more information, go to: www.nj.gov/dep/wms/bwqsa/c1waters.htm. To view a map of the protected waters of the Barnegat Bay watershed, click here. Do you have it? If so, we want it!